Every year at CES Razer brings out crazy new concept devices. 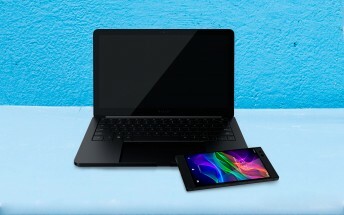 This year we saw Project Ariana (an immersive video projection system) and now Project Linda – a laptop dock for the Razer Phone. Linda has a 13.3” screen with QHD resolution, 120Hz refresh rate and HDR support, similar to the phone’s own screen. That screen will be used as sort of secondary display/touchpad. But there’s also a full-screen keyboard complete with customizable Razer Chroma backlighting (because nothing says “Razer” like RGB lights). Once docked, the phone will use its Snapdragon 835 chipset and 8GB of RAM to provide a smooth Android experience (with some custom keyboard shortcuts for faster navigation). 200GB of additional storage are available (for backups or just more games), a full size USB-A port, USB-C for charging and even a 3.5mm audio jack (which the phone itself lacks). The Project Linda dock has a 53.6Wh battery, capable of fast-charging the phone up to 3 times. It measures just 15mm thick and weighs 1.25kg. As with other Razer concepts, there’s no certainty that Project Linda will ever get a consumer release. For now Razer is gathering fan feedback, but we wouldn’t get too attached – juts take Linda for what it is, a cool-looking concept. Razer Phone: Is this actually the ultimate gaming phone?